3 Bedroom Semi Detached House For Sale in Northallerton for Guide Price £220,000. 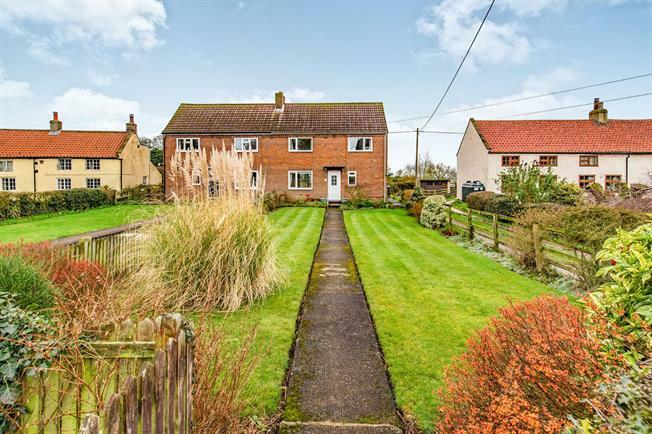 This three bedroom semi detached property is placed upon a generous plot with rolling countryside views at the rear of the property. There is great potential to improve and modernise throughout, the living accommodation is generous on both floors with the external space in abundance. This property is offered to the market with no onward chain. Spacious lounge with patio doors leading out to and looking over the rear garden, fully carpeted, and feature fireplace. Dual aspect windows. Large kitchen / Diner with a good range of wall and base units, leading to a utility space. WC, Comprising a standard flush W.C.
Workshop with electrical points and lighting. Master bedroom with in built storage space, over looking the front garden. Fully carpeted, with upvc window overlooking the garden. Fully carpeted with uPVC window overlooking the garden. Shower room comprising, standard flush wc, pedestal sink and wash basin.